At Roby Park Primary School, we recognise that each child has unique qualities and abilities. Children may have learning, physical, emotional/behavioural or social needs which may require special support or provision over the long or short term. All staff at Roby Park Primary School are committed to meeting the needs of all children with SEND and the school will make reasonable adjustments to accommodate all children where practical. Roby Park’s provision reflects the SEN Code of Practice 2015 and the Disability Discrimination Act 2005. 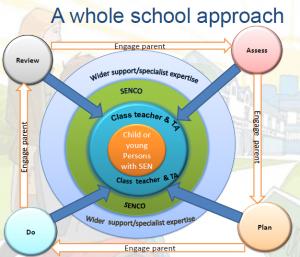 If you have concerns about your child’s rate of learning or development, speak to your class teacher or make an appointment to see Mrs Lyon – SENDco and Inclusion Manager. Please read our ‘Special Educational Needs Information Report’ which outlines how we support children with Special Educational Needs or Disabilities at Roby Park. If you have any concerns you wish to discuss please contact Kathy Lyon (SENDco and Inclusion Manager) by calling the school office 0151 477 8340 or emailing robypark@knowsley.gov.uk.